No Barriers Summit was so much fun. 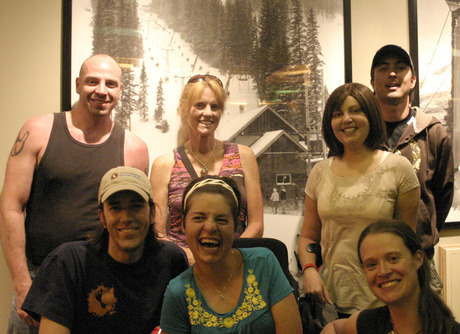 This is an amazing article written by Benn Stebleton who was one of four of the participants that Footprints Adventures sponsored to attend the No Barriers Summit in Winter Park Colorado. We had such a great time and look forward to other great times had with this group as well as more great stories written by Benn. The Group at No Barriers. This is an amazing story. No barrier for these people that try to give a good response to all. I would like to recommend your article.Excellent post! I must thank you for this informative read. I hope you will post again soon. There are insurance plans and policies to cover hitchhiking, trekking, road trips, boat trips. Whatever traveling you have in mind and wherever you want your travel to take you, backpacker travel insurance gives you the flexibility that is necessary when it comes to taking a backpacking holiday. there are so many customizable components in these laptops. Lo studio Dentistico Roma Dottori Damis Resta Rossi Iommetti è situato nell'elegante quartiere Prati di Roma ed opera nel settore odontoiatrico dal 2005. Thanks for your great article friend, i get new information, new ideas to do somethings, i hope you will share again. To awesome skin care after you wash the face properly you need to use a exfoliant. Find the right people for the surface form and attempt to have a granular an. I am actually delighted to glance at this blog posts which includes plenty of usefulfacts, thanks for providing such information. A current client of mine will be relocating to your area and wanted me to find a practice to suit their family’s needs. Based on your website and your online reviews this looks like best practice for them. ( http://goo.gl/icBzFq ) Keep your eyes open for the Jacobsen family! Great post ,i appreciate your efforts in making this post.Thanks for sharing this informative article. Great post about adventure ,i appreciate your efforts .Thanks for sharing the post. Its is nice rock climbing blog and I am agree all of you that its a well described about rock climbing. Thank you for it. check out Top Android Phones under 20000 with Good Battery Backup 2017. I really impress to your all post here is more information for us thanks for sharing this amazing post. Five nights at freddy's http://fivenightsat-freddys.com free full games.